What a slacker hey ! 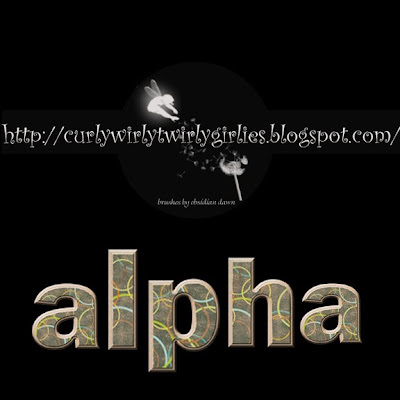 I promised I would come back and upload the alpha, then fell asleep LOL. After dinner I was reading with the kids - we are reading the Magic Faraway Tree series by Enid Blyton. For comfort the kids come and lie on our bed whilst we read, and it was warm and cosy and ZZZZZzzzzzzz LOL. My poor body is catching up after five very intense months on a project. Anyway, this is my attempt at stripping and sanding some paper off a chipboard alpha. This is not the best way to do this. There are grunge and sand overlays you can use, better brushes etc, but I don't have those, or the experience to know the shortcuts and tricks. So if you are one of the people who are new to all this like me, who have left some really wonderful messages and are going to have a go then do have a try. I tried a couple of other ways first and was unhappy with the results for this, but learnt something I could use somewhere else. I was really touched and thrilled to get messages from people saying they were like me and intimidated by PSE or what others could do, and are now going to have a go. I am so pleased that by just sharing my learning adventure other people are going to try. I could ask for nothing more. So, I had better just shut up and let you have a look at the results, constructive comments and feedback welcome ! I love these! I love all your designs, in fact. I can also relate to that falling asleep while reading. I even once fell asleep while reading OUT LOUD to my daughter! LOL It was a well loved book, so she knew the words. She says I started saying weird stuff. This looks great! But to save yourself time I will tell you two secret words. Atomic Cupcake! I have gobs of her actions and they save me untold amounts of time. wow thank you for these hon..haven't got to use any of the actions yet and trying to work out how to use them in Photo impact..they all look fabulous though..thanks for sharing your creations with us here huge hugz from oz.